Get into the spirit of horse racing by creating your own horse race board game. You only need a few materials that you probably already have around your house and a healthy dose of imagination to make your own board game. You can even add an educational component to the horse race board game if you are playing with children. It may be necessary to modify the game depending on the age and developmental level of the people playing. Cut the poster board in half. One half will be the game board, and the other half will be used later to create other game board pieces. Use the markers to draw a round track on the poster board. The track should be at least as wide as the buttons or coins you will use as game board markers. Using the ruler, separate the track into 1-inch squares. Use brightly colored markers to color each square. Be sure squares that touch are different colors. Every few squares, write the numbers "1," "2" or "3" with a black marker. Leave some squares without numbers. Draw three playing-card-sized boxes in the middle of the track. Label each box with a "1," "2" and "3." Label a starting gate and finish line on the game board. Cut the unused half of the poster board into playing-card-sized pieces. Separate these pieces into three equal piles. Label one pile "The Kentucky Derby (1)," another pile "The Belmont Stakes (2)," and the last pile "The Preakness(3)." On each card, create a question for a player to answer. 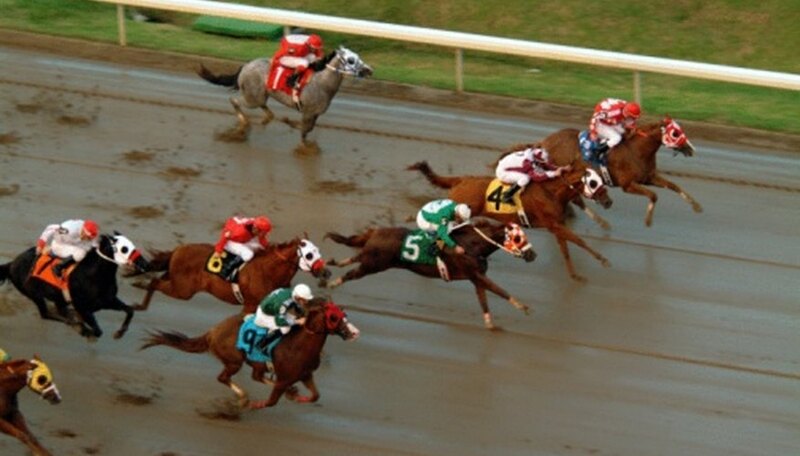 These can be questions related to horse racing for racing fans, or educational questions if you are creating the game for educational or classroom purposes. Give each card a value depending on the difficulty of the question such as "one space" or "two spaces." Place each pile of question cards in the middle of the track on the drawn boxes. Cover the game board and all game pieces with clear contact paper for durability. To play the game, players will roll two die and move their game piece around the squares of the racetrack. Use coins, buttons or small plastic horses for game pieces. Players will move around the track, answering questions when they land on the numbered square. If the player answers the question correctly, she will move ahead the number of squares listed on the question card. If she answers the question incorrectly, she can either move back one square or miss her next turn. Modify the directions as necessary depending on the players' ages and abilities. Kara Bietz has been writing professionally since 1999. Her professional observation work has appeared in the early childhood education textbook "The Art of Awareness" by Margie Carter and Deb Curtis. Bietz has worked in the field of early childhood education for more than 16 years. She holds an Associate of Applied Science in child development from Mesa College.